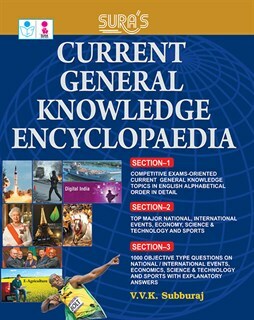 Current General Knowledge Encyclopaedia Book 2016 aims at enlightening the aspirants appearing for various higher level Competitive Examinations and enriching their knowledge on current events. This compendium has incorporated all the events that have taken place in the recent past at National and International levels. Events and affairs have been arranged in alphabetical order for easy reference. The Section-1, deals with Current Affairs and General Events. The Section-2, exhaustively deals with events that had taken place last year and follow-up actions taken thereafter until today. The Section-3 contains 1000 Multiple Choice Questions to test your knowledge. Detailed answers follow each question. The salient feature of this book is that all the events have been analysed. Besides this book also gives details of the major landmark events of the year 2015-16. More often questions in exams are framed on these events. Therefore grasping them with utmost care should be a major focus area while working out a study plan for yourself. The book has diligently been prepared in lucid, clear and crispy language which on the other hand brings the joy of knowledge to the students /scholars and competitive exam aspirants and on the other hand help our dear and valued readers scale new heights and realize their cherished dreams. Thus the book fulfils the needs of all those who have a penchant for current knowledge and those who wish to keep abreast of information that is playing a dominant part in further enrichment of our civilizational values. Since it is fundamentally current general knowledge book it is an ongoing process requiring suitable revision from time-to-time. We have done our best in incorporating the competition – oriented information which will definitely, as we strongly believe, quench the thirst of all those whose satisfaction is our main motto in publishing this striking compendium. As we always try to understand the demands of our readers, the book has been prepared keeping in mind their suggestions based on the recurring changes in the pattern and contents of various competitive exams. It is our earnest hope that the utility and usefulness of the book will be established once it is thoroughly studied before appearing any competition. Through this compendium our only wish is to lead and guide our dear aspirant readers to the path of grand success. How far have we succeeded in our endeavour will only be revealed by time. With best wishes for your bright success.